According to the U.S. Department of Labor, the average American consumer unit spent $6,602 dollars on food in 2013. Food represents the third largest household expenditure, next to housing and transportation. If there’s one aspect of the household budget where a family would consider making some cuts in order to save more money, it would be food. In short, households would be looking for healthy yet cost-effective meal options. 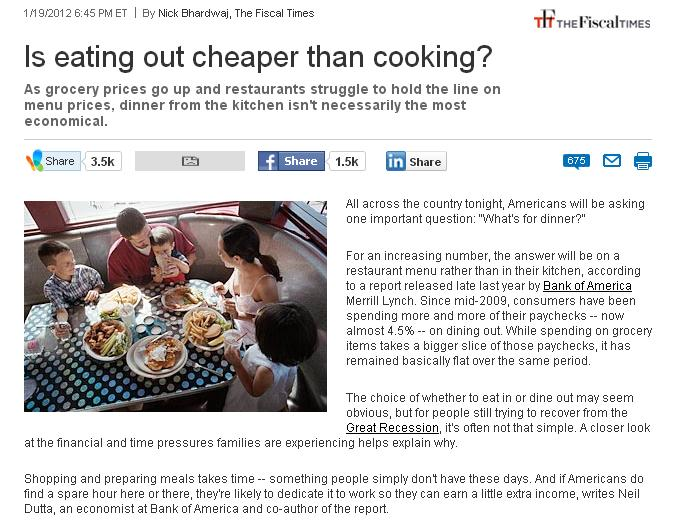 In his article for the Money section of MSN.com, The Fiscal Times contributor Nick Bardwaj discusses why a lot more Americans now consider eating out to be more economical than home cooking. Shopping and preparing meals takes time — something people simply don’t have these days. And if Americans do find a spare hour here or there, they’re likely to dedicate it to work so they can earn a little extra income, writes Neil Dutta, an economist at Bank of America and co-author of the report. On top of that, supermarket food prices are increasing at a staggering 6% a year, about 2.5 times as fast as the cost of restaurant meals, according to the report. It is becoming cheaper for consumers to dine out. “It’s all about substitution, as prices at grocery stores rise, consumers will respond by making choices,” says Dutta. There is also the matter of convenience to consider, especially when it comes to family gatherings and special occasions. Busy individuals do not always have the time or the energy to whip up a feast like a pro. The solution? Look for a reliable Sacramento catering provider. Whether your family is celebrating grandma’s birthday or daddy’s recent promotion, and you’re having quite a number of guests over, nothing sure beats classic homemade comfort food from a well-loved restaurant like Sam’s Hof Brau. If you’ve got a craving for mouthwatering roasted turkey, carved roast beef, BBQ beef ribs, and other yummy side dishes, for example, you’ll be thankful you’re having the food catered instead of taking on the monumental task of preparing everything yourself. Catering also makes it easy to manage your expenses as most set menus already come with a cost per person computation. Once you’ve confirmed your party headcount, you can easily arrive at an estimate. This way, you can plan your expenses accordingly and won’t have to go over budget. Whether you require simple food delivery or full-service catering in Sacramento, you can count on a restaurant like Sam’s Hof Brau to offer big and healthy meals at prices you’ll love.